A couple of my favorites are soft serve ice cream 11am-11pm every day, the fantastic desserts at Topsiders (or Beach Blanket on the Wonder), and the great sandwiches at Goofy's Galley. And don't forget room service and deck 9 soda, 24/7! But enough about that...let's get on to the Mickey Bars. The fantastic Disney servers in the ship's restaurants go far far out of their way to make sure that you have anything that is within their power to get for you. Great, great story about the best banana bread I have ever tasted, but that's another post! :) Sorry, I keep drifting on the seas of DCL food. 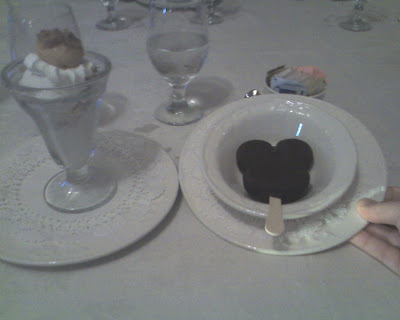 So, each evening dinner on my 7 day cruise, I ordered a Mickey Bar (it's on the children's menu) to go with my dessert choice. Too much you say?? I don't think so! I just love those Mickey Bars...and even after 7 days I still feel the same. Nachos are good! Although I have never had them for breakfast. Bacon and Egg Nachos anyone? lol.